Dates wine/ Date wine is well-balanced with fresh fruity flavours and mild sweetness to give you refreshing as well as exotic feel. As we get ready for the festive season, here is a plush wine to celebrate with family and friends. If you have made wine at home, at least once, you will certainly love trying out this wonderful recipe. Making wine at home, is an exuberant experience, it is the art of perfecting the balance of flavors, sugar and acid. If you are a beginner, don’t be overwhelmed with the complex procedures; try with a basic Grape wine recipe and you will enjoy the experience! Whether it is a small get together, party, wedding or festive occasion, it is always a good time to have wine to raise your spirits. To spread the cheer, I prefer homemade wines to store brought ones. Pair the Dates wine with traditional Fruit cake, Dates and Banana Cake, Carrot Dates Cake, Orange cake or any other tea cake to entice your guests. You should also try my Banana Raisin Wine, another brilliant Wine recipe to add to your winery collection. Like every Wine, Date wine gets matured and flavourful when allowed to age gracefully. 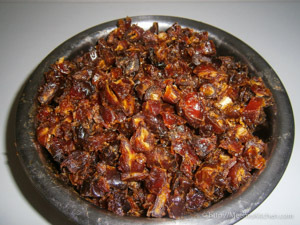 Dates are seeded and boiled to make it soft and to release sugars. Citric acid is added to Dates Wine to stabilize the acidity, or the fermentation process will slow down. Making Dates Wine can be a little challenging as there are several processes to be followed, but let me assure you the results are amazing! Get ready, to brew the happiness and welcome the vibrant festive season! Cheers! Citric Acid : 15 gms. Sterilize all the vessels and ceramic / Glass Jar with hot water and dry before use. Measure and keep ready all the ingredients. Boil and cool 2 liters of water. 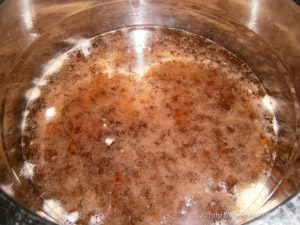 Remove the seeds and boil the dates in 1 liter of water for half an hour. Let it cool. Transfer the dates with water to the Ceramic/ Glass Jar and add the cooled water. 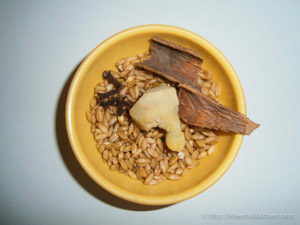 Now, add the whole wheat, sugar (500 gms), Crushed Ginger, cloves and Cinnamon to the jar. 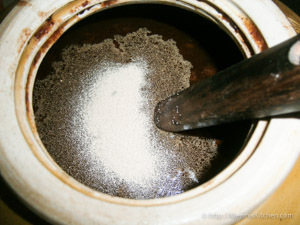 Take ¼ cup warm water and add yeast to it with 1 tsp sugar. Mix well and keep covered for 10 minutes. Add this to the jar and stir to combine. Lastly, add the Citric Acid and stir again to mix. The jar should be big enough to leave ample space for fermenting. Tie the jar airtight with a cloth and keep in a warm place. Stir once every day for 21 days with a long-handled spoon, at the same time. This is the fermentation period. Close the lid nicely each time. After 21 days, leave it untouched for two days and strain the liquid using a muslin cloth; squeeze tightly to remove all solid part and transfer into another sterilized dry jar. You can strain again using another clean cloth to remove all husk. Tightly cover the jar with a cloth and lid and keep in a cool dark place for another 21 days without disturbing to clear the wine. Then, transfer the wine to glass bottles using a syphon pump. Keep it in a cool place to age gracefully till you get a clear, Golden Orange color liquid. Enjoy, gift and spread the cheers!! Use good quality Dates for making this wine. Dates are to be boiled to make it soft and then cooled before preparing wine. Always use boiled and cooled water to make wine. Citric Acid helps to stabilize the acidity and ensure proper fermentation. During the fermenting period wine jar should be stored at warm, normal temperature for fermenting nicely. Use wooden spoon to stir the wine and try to stir at a set time every day, if possible before sunset. Like all wines, Dates wine wine tastes better if you keep ageing it for longer period. Always keep in a dark cool place for ageing. 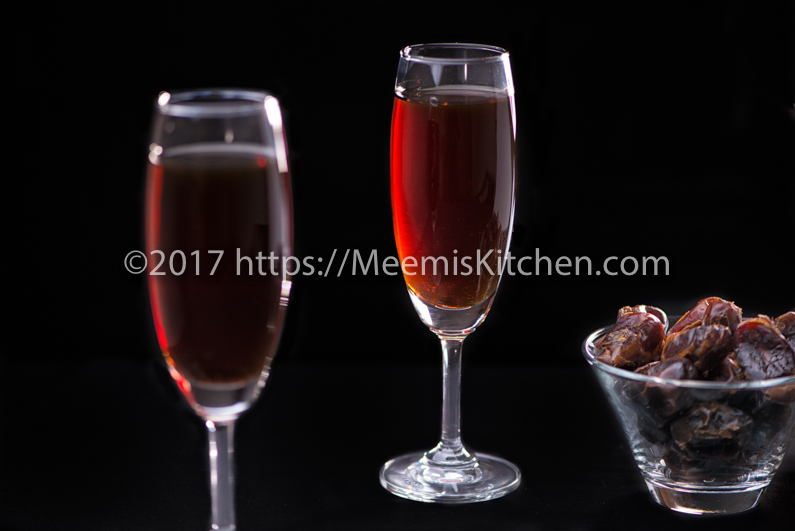 Amaze your guests with refreshing Dates Wine this festive season. God Bless!! Turned out awesome! The right sweetness and zing… thank you for the recipe. Very happy to hear that. Thanks for trying!! Is there an alternative grain? Avoiding wheat allergy. Hi Zoe, thank you for visiting meemiskitchen. In dates wine, you may avoid wheat if you are allergic. Wheat makes it stronger, as the wheat starch is converted to fermentable sugar by yeast. You can avoid wheat and follow the same recipe. The wine will be little mellower, but won’t affect the taste much. Can we use Bread yeast or Dry yeast. Hi D S Bisht, You should add only dry yeast for wines. Hope this helps. Is citric acid a must to make this wine? Hi Jemi, Thank you for your query. I would recommend adding it. Citric acid helps to make dates wine more acidic and helps in fermentation. It also contributes to the flavours. Can I add white vinegar instead of citric acid. Hi Naveen, You need to add Citric acid for best results. Lime juice is another substitute, but not vinegar. Lime juice might cause a slight bitter taste, so citric acid is advised. You get Citric acid in all supermarkets.